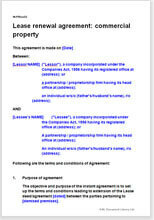 This document sets the terms between a lessor and a lessee who want to extend the lease of a property - commercial or residential. There is little or no statutory regulation relating to an agreement of this nature, so the parties can make more or less what deal they choose. Appropriate legal provisions - warranties, exclusions, indemnities.